We have been loving these lately! 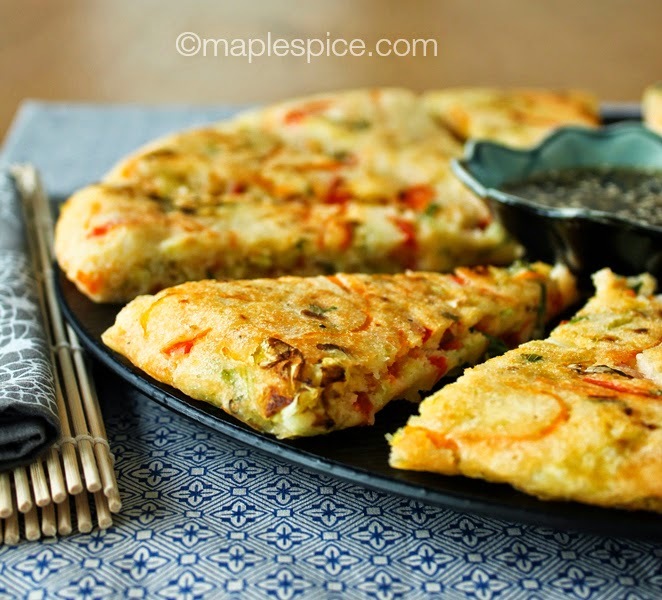 I was inspired by these Korean Veggie Pancakes or Pajun from A Spicy Perspective which just looked soooo good. 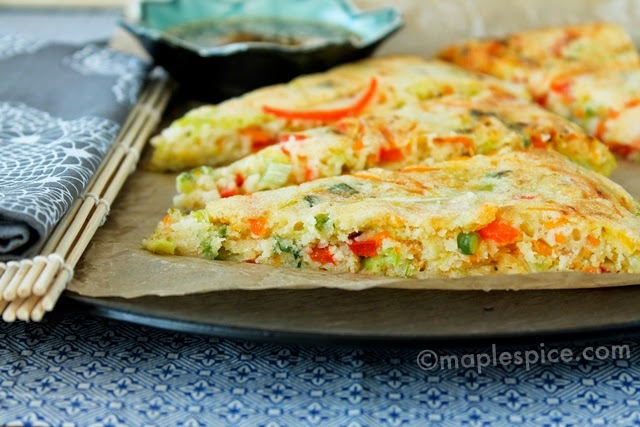 The finely shredded vegetables in them though reminded me of my Veggie Spring Roll filling though so I decided to make these like spring roll pancakes, so you get all the great flavour of spring rolls in pancake form! The only thing from my spring rolls that I didn't add was the bean sprouts as I thought they would take up too much room and upset the texture. 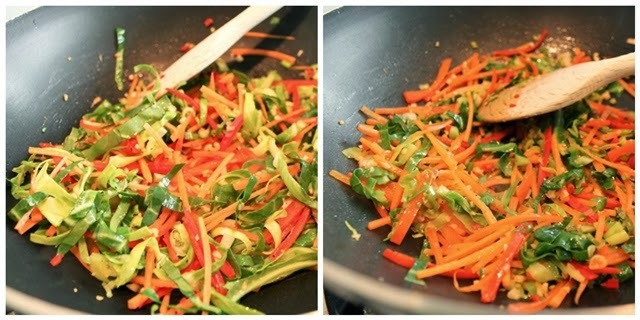 Then I added a dip with the seasonings I usually add to my spring rolls - soy sauce and toasted sesame oil. These are also very easy to make but please note that the size of the pan you use is absolutely crucial! 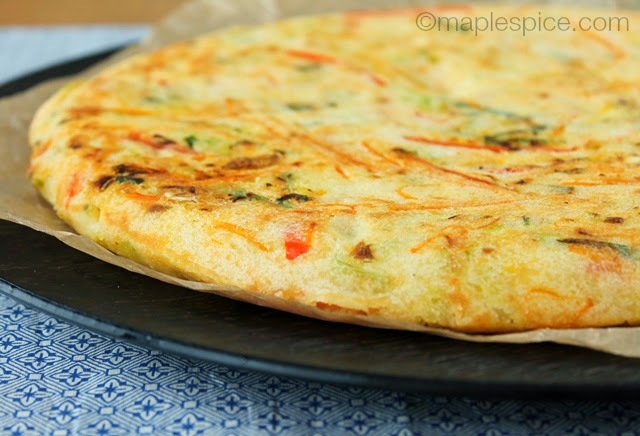 These are best when they aren't too thick, I've used a 10" non-stick frying pan here which is perfect for this amount of batter, but I'm sure you could use a 12" frying pan as well. 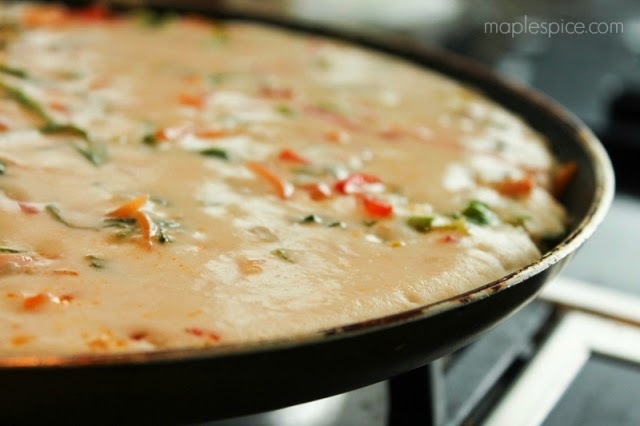 Make sure the pan has fairly low sides that slope to ease flipping. I have also made this as an individual pancake using a smaller pan. If you want an individual serving just divide the recipe by ¼ and use a 6" frying pan but please note that having leftovers of these is not a problem at all. They both re-heat brilliantly AND even taste great cold - they would make great picnic food :-) To reheat simply pan fry until hot on both sides. 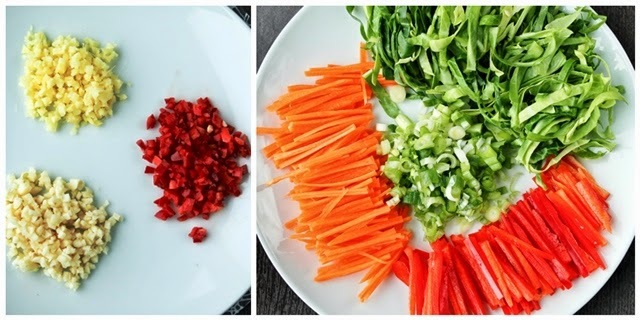 Note: As long as you use a total around 200g - 250g of veggies you can use whatever quick cooking veg you like here as long as they are sliced thin. I've made this with tenderstem broccoli and green beans in place of the cabbage and red peppers for example. 1. Get all the veg chopped and ready - garlic, ginger and chili on the left there, carrots, red pepper, cabbage and spring onions on the right. 2. Make the batter: Whisk together the rice flour, baking powder and salt. Add the soy milk and sparkling water and whisk really well until smooth. Set aside. 3.Heat the peanut oil in a wok add all the veg and some freshly ground black pepper and stir fry on high heat until soft and the cabbage has wilted. This should take no longer than 4-5 minutes but make sure there is no liquid left, if the veg start to stick to the pan that's perfect. 4. Place your 10" non-stick frying pan on medium heat and brush with a little peanut oil. 4. 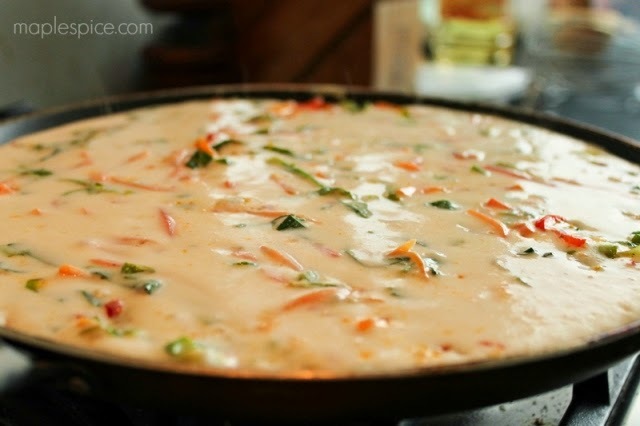 Now add all the veg to the batter and give it a quick stir with a fork then quickly tip it onto the preheated frying pan, spreading it out with a spatula so that it fills the pan and is nice and even. ...and let it bubble away! 5. Fry until golden brown underneath, you can peek by sliding a knife underneath to have a look but also, the pancake edges should be firm and cooked and even the whole top of the pancake should start to look fairly set. Before you move the pancake, make sure it isn't stuck at all by carefully sliding a spatula around the edges and underneath to loosen. Then shake the pan back and forth, if the pancake moves from side to side then it's ready to flip. Do NOT try and flip this if the pancake doesn't slide around in the pan!! Note: if you aren't too confident in flipping this you can pop it under a pre-heated grill to cook the other side. When I do this I do still fry the other side to get it crispy but since it's already cooked and firm on both sides, flipping it will be a breeze :-) Just make sure your frying pan is grill safe. 6. Slide the pancake onto a large plate and add a little more peanut oil to the frying pan. Now, put on some oven mitts and place the frying pan over the plate and flip the whole thing over - frying pan and plate so that the uncooked side is down on the frying pan. Remove the plate. 7. Fry the other side of the pancake until crisp and golden. 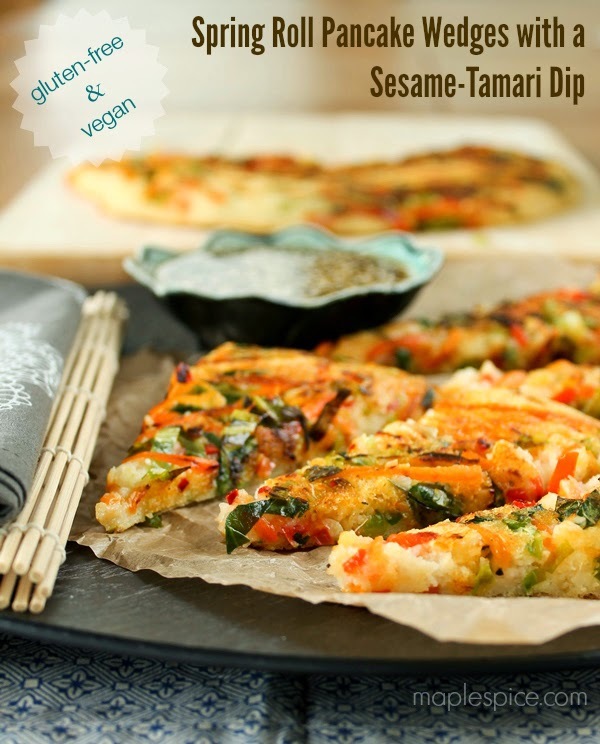 Slide onto a chopping board and slice into wedges and serve with the tamari-sesame dip. Now the dip is essential here. With the exception of a little salt in the batter there is no seasoning in the pancake, that's what the dip is for. 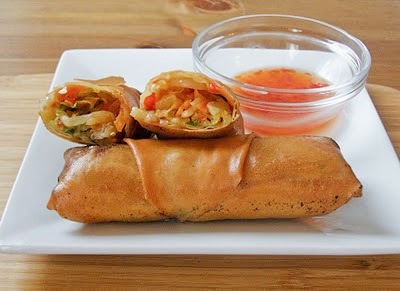 My spring rolls call for soy sauce and sesame oil in the mixture so I've opted for those flavours here as well. I also threw in some sesame seeds like A Spicy Perspective did and they really add to it. 2 tsp Sweet Freedom Syrup (vegan honey) or use light agave. Simply whisk all together. 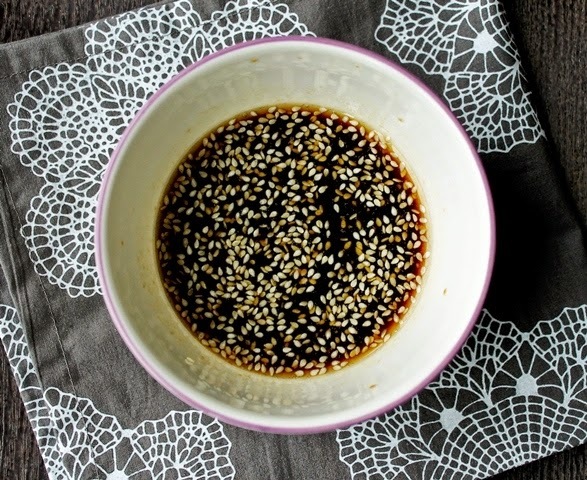 If you find it a little strong, feel free to add some water...I do love my soy sauce:-) I should also note that I personally prefer this taste wise with soy sauce but the difference is negligible. Nutritional Information: for 1 serving out of 4, dip not included. This looks bananas delicious! wow! hi :) just wondering why you used sparkling water - will non-sparkling water work just as well? Hi mel! Thanks for the comment :-) I use sparkling water (as I do in my regular pancake recipe) as the carbonation reacts with the baking powder and helps give a light texture and rise. Regular water won't work as well, you'll still end up with a pancake but I suspect the texture won't be as fine. So um, this looks incredible! 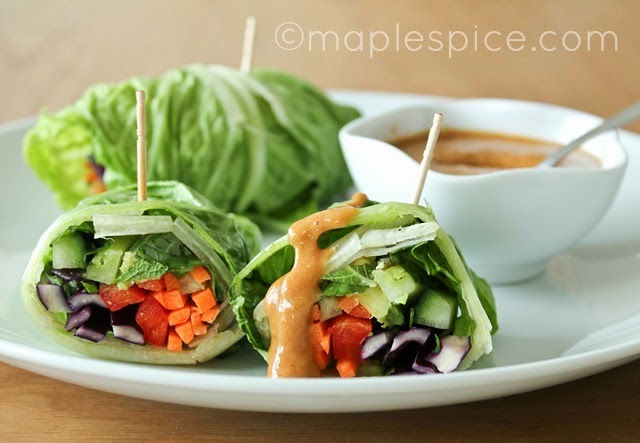 Spring rolls are in my top 5 favorite foods so I'm down for more clever ways to eat them. And to comment on the sparkling water, my husband asked what the ingredients were and said he thought that the sparkling water added to the light texture, so I do agree, that is essential or the whole thing might be to dense and heavy. 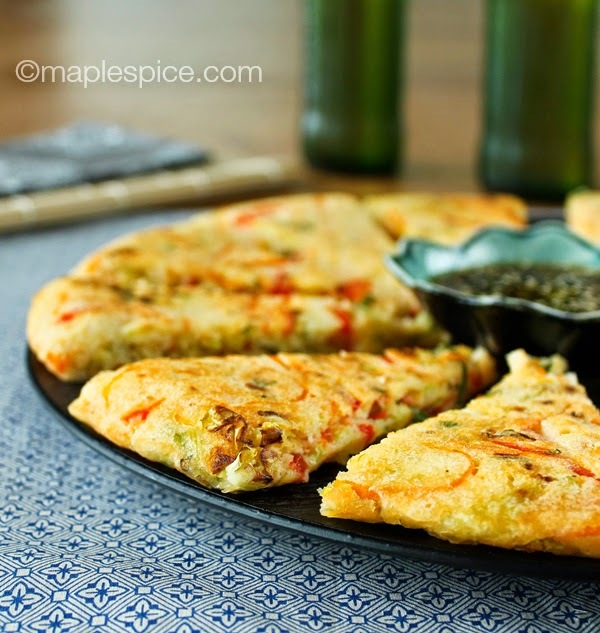 I made this for dinner tonight and while we loved how it tasted, we were a little surprised by the texture. I've never used rice flour before so I don't know if that was the culprit, but while the pancake was crispy and golden on the outside, the inside was still really moist and almost mushy. Do you think I should use less water or more flour next time? Or is this how it is with rice flour? Hmmm, no, something definitely went wrong here. 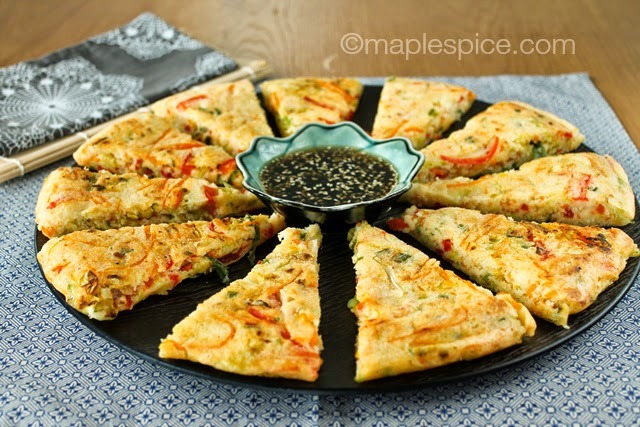 The texture should be dry, light and fluffy – pretty much the exact opposite of what you have described! Sorry it didn’t work out for you (but glad you liked the taste!) You shouldn’t have to change the recipe at all (more flour/less water) as I tested this about 6 times before posting so it really should work out as is. Thinking about it then, there are a few things that possibly *may* have happened: The vegetables might not have been fried until dry before being added to the batter, that would have added extra liquid to the batter OR the vegetables might not have been fried long enough resulting in the water in the not being released from the veggies until they were in the batter again causing too much liquid to get into the batter….or the pan may have been too hot so it got golden and crisp on the outside but didn’t have time to fully cook in the middle.